Calling all Victoria Kadima-aged kids! on Sunday, October 23 at 8:15 am at the Herzogs’ Sukkah in Victoria. See you there! WildPlay—last event of the year! 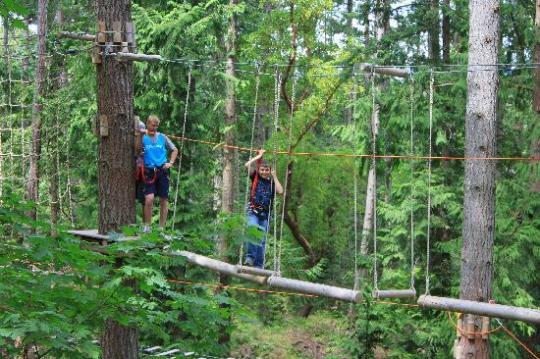 Don’t miss your chance to climb ropes and rappel through trees – WildPlay is back by popular demand! This event is fully funded for all our youth in grades 6-12 (thank you Apples & Honey!). Parents are invited to participate for only $10. Pizza lunch included! Please note, reservations are required and we must pay for all who reserve, therefore, we will charge you a $20 cancellation fee to cover our costs if you reserve and then cancel after May 20. To hold your spot or to learn more, email Howard Herzog. You can also email RaeAnn. Posted on May 13, 2016 Categories UncategorizedTags Kadima, WildPlayLeave a comment on WildPlay—last event of the year! First, a HUGE thank you to everyone who helped bake, decorate, pack and/or deliver apples and honey cakes so that we have funding for activities this year including: Rachel Fisher, Gaylia & David Lassner, Lucie & Ana Nerenberg, Julia & Howie Herzog, Zsofie Biro, Ellen, Jean & Graham Dragushan, Penny Ross, Marvin Kurier, Sid Tafler. Also, a really big thank you to Jill Swartz and Mike Goldstein for donating their apples—and gratitude to Chanah Caplan, Corinne Sharpe & Zelda Dean for helping to manage the details. First up for USY is an opportunity to fulfill some volunteer hours and raise money for events and for tzdakah – we’ve been asked to run the concession for the upcoming play, The Grandkid, on Sat Oct 24 at 7:30 and Sun Oct 25 at 2pm, repeating the next weekend. Please email me if you have time to help sell goodies during intermission. Kadima kicks off with a Pyjama Breakfast, before Hebrew School at 8am on Nov 1. The best part of this is it’s the end of Daylight Savings, so you won’t lose any sleep getting to Hebrew School early! It’s a treat for those in Grades 6 & 7, and Grades 8-10 please come and help and join in the fun. Julia and Howie Herzog have generously offered to help plan and supervise events for Kadima—call them to participate or volunteer. All students (and their parents) in grades 6-12 are invited to attend. RSVP is required by Mon, Aug 18 to by email to Rae Brechner. Feel free also to email for more information (such as cost). In other news, be on the lookout for information about ordering your honey cakes for the Kadima/USY Apples & Honey fundraiser for the New Year. If you’d like to volunteer to help deliver baskets on Sept 21, if you have apples from your tree to donate or if you would like to help bake cakes in the synagogue kitchen, email Rae Brechner.